Who for – Those who currently hold a First Aid at Work qualification and are due to expire. 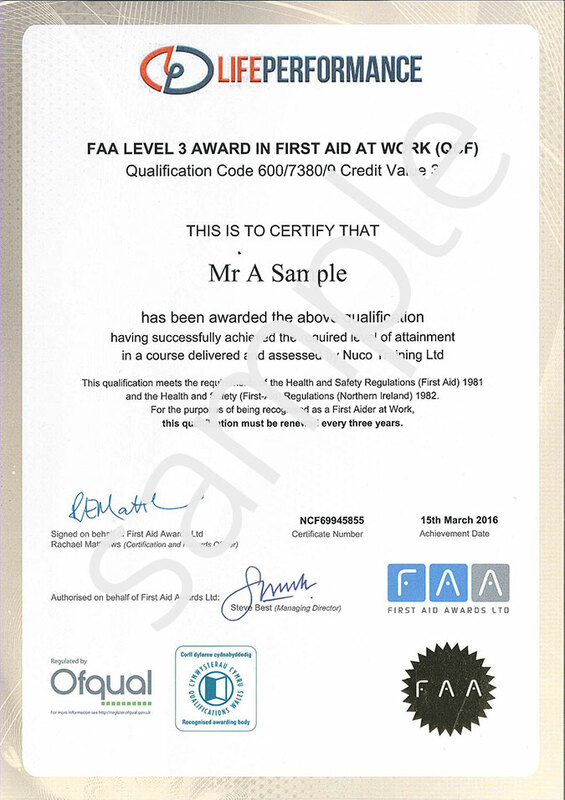 Awarding body – FAA level 3, Ofqual approved. Duration – 12 classroom hours, ideally over 2 days, however we can accommodate specific needs providing the course is complete within 10 weeks. Acts and regulations, first aid provision, responsibilities, scene assessment, hygiene, first aid kits, reporting, casualty priority, primary and secondary assessment, unconscious casualty, airway management, top to toe survey, recovery position, cpr, defibrillator training, choking, shock, fainting, bleed control, amputations, epilepsy, asthma, heart attack, angina, diabetes, stroke, open fracture, closed fracture, support sling, elevation sling, spinal injuries, head injuries, concussion, compression, skull fracture, sprains, strains, dislocations, bruising, chest injuries, abdominal injuries, crush injuries, electricity, anaphylaxis, poisoning, burns, chemical burns, hypothermia, heat exhaustion, heat stroke, eye injuries, embedded objects, splinters, bites stings. Child and baby techniques. Summative practical assessment is ongoing by the instructor each day, along with a written assessment on each day. A three year Level 3 (Level 6 in Scotland) Award in First Aid at Work will be issued to the learner, subject to successful assessment. A First Aider can renew their First Aid at Work qualification by attending a 2-day requalification course without question, if it’s within 1 month past the expiry date. If the First Aider has lapsed by more than 1 month, but no longer than 3 months, then the First Aider can requalify by attending a 2-day course providing ‘Special considerations’ have been applied. A signed letter from the employer to the provider of the training stating the reasons why in their opinion, the First Aider is suitably experienced to attend a 2-day course and does not require a full 3-day FAW course. Price – £120 per person / £650 for groups of 6+.